Amenophis, 1982 AMENOPHIS first concert was in October 1979. In 1980 the band bought a comprehensive equipment and Erwin Hillebrand joined AMENOPHIS on keyboards. AMENOPHIS had several gigs in the southern part of Germany, mostly together with more known bands to reach a wider audience. The Flower, the second song on the first album is an example of the activity of this period. In 1981 and 1982 AMENOPHIS increased their repertoire by composing up to 30 titles. Songs like Venus and The Last Requiem were written at this period. The band gave 12 concerts between 1981 and 1982 until they decided in end of 1982 to do recordings. Since a professional studio was too expensive for the band, AMENOPHIS decided to build their own studio from their live equipment and an the 8 track tape from sound engineer Rudolf Wiedemann. 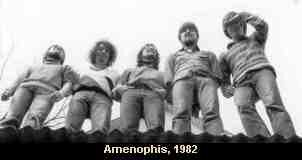 End of 1982 AMENOPHIS started their first recordings in their studio. They did a lot of experiments, the bonus tracks on the CD release of the first albums are a part of the outcome from this period. Amenophis, 1988 In 1984 and 1985 AMENOPHIS was very quiet. They did some smaller sessions with guests musicians but no new songs were written. Early 1986 AMENOPHIS got the offer recording a second album. This project was called You & I. Kurt Poppe on keyboards and Rene Kius joined the band. The following year the band built up a completly new repertoire and in Nov. 1987 AMENOPHIS could be seen live again. Early 1988 AMENOPHIS recorded the You & I album with ELke Moerle on vocals. Later on Isolde Reichmann on vocals joined the band in 1988. Until 1989 AMENOPHIS did several concerts and interviews on radio shows. After over 10 years AMENOPHIS gave the goodbye concert in June 1989.